What did I do over winter break? I played with 22k gold! It was amazing. And nerve-wracking. And absolutely worth it. Every metal feels different to cut. Nickle is kind of rough and springy, copper is a bit softer than nickle, silver is smooth, like gliding through with every cut. I had been told, however, that gold is like sliding against silk. Working with gold has been on my wishlist since I started cutting metal. I was thrilled when a couple approached me with a commission that required gold. 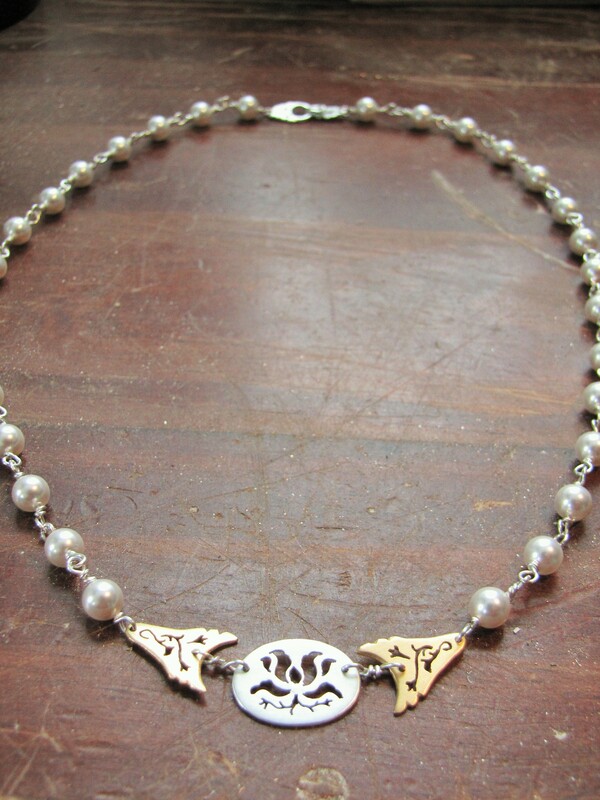 They wanted a version of another necklace I had made for myself years ago. 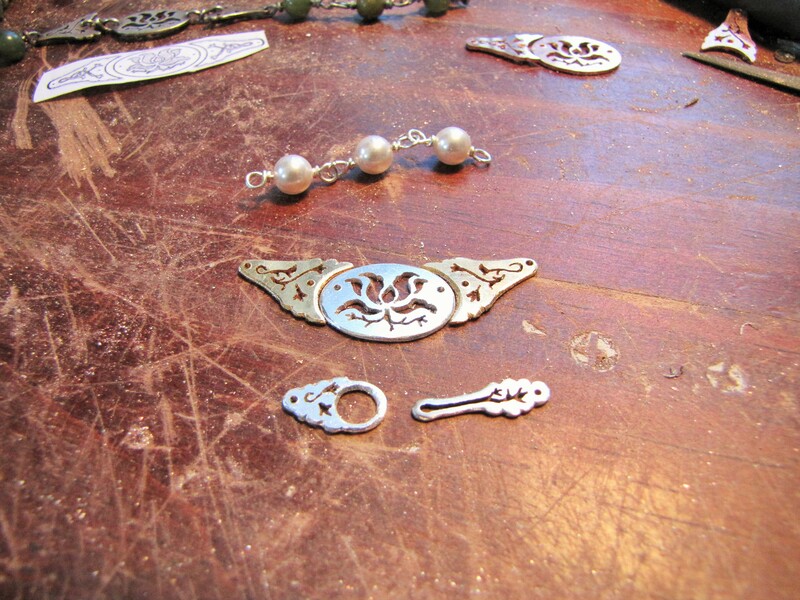 Only they wanted imitation pearls instead of jade beads and gold for the side leaves instead of all sterling silver. 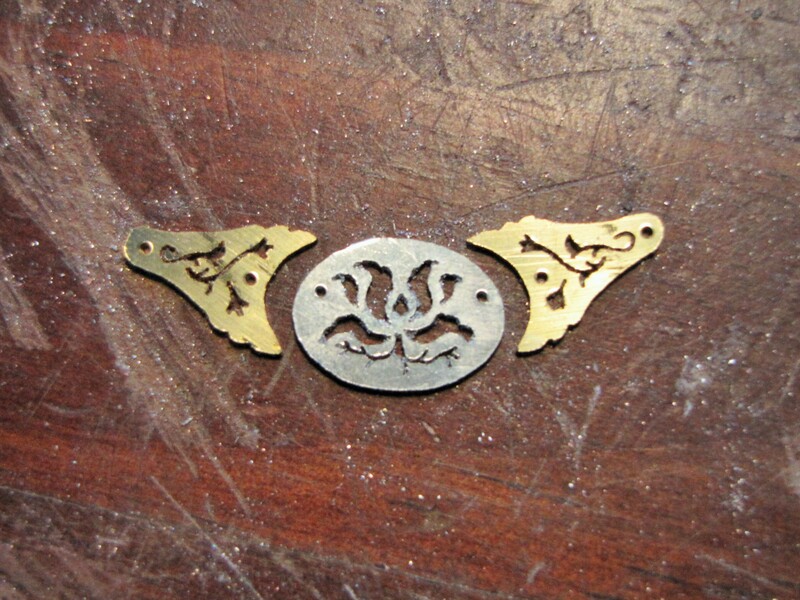 The original necklace and the design to cut out. I was excited because I knew the combination would be gorgeous! And then I got nervous. What if I messed up cutting the gold? 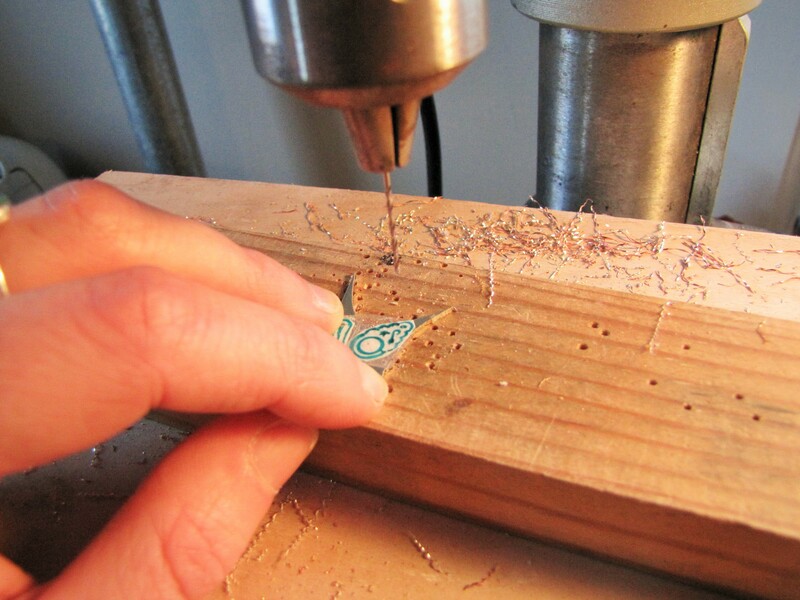 After a deep breath I sat down with my pattern, drilled the holes after checking about five times if I had everything lined up right, and then, slowly and arduously, began to cut. It was a beautiful feeling, the metal gave easily, almost like liquid, to every move of the saw. It was everything I had imagined! And I didn’t mess up! 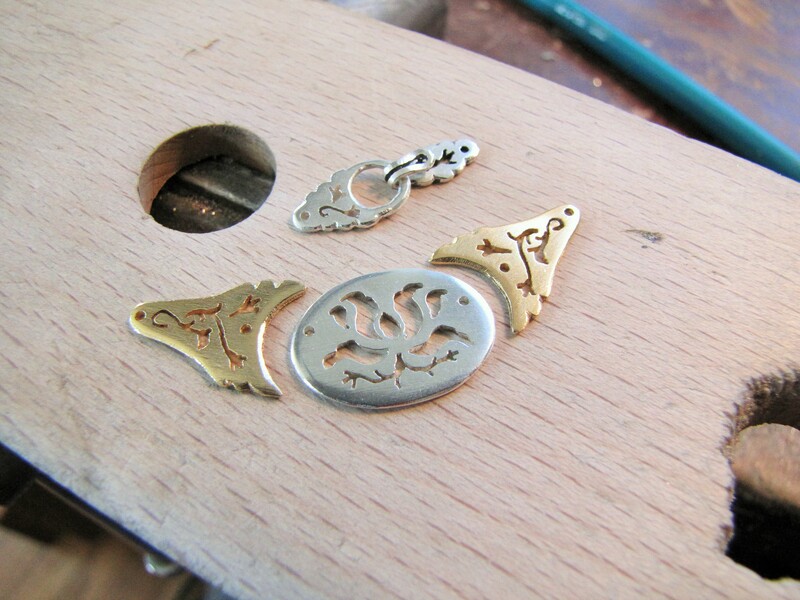 The gold and silver focal points of the necklace, cut and waiting to be filed and finished. I ran into a snag when I realized the wire clasp I had Jerry-rigged for the original necklace would not be appropriate for this, higher quality version. 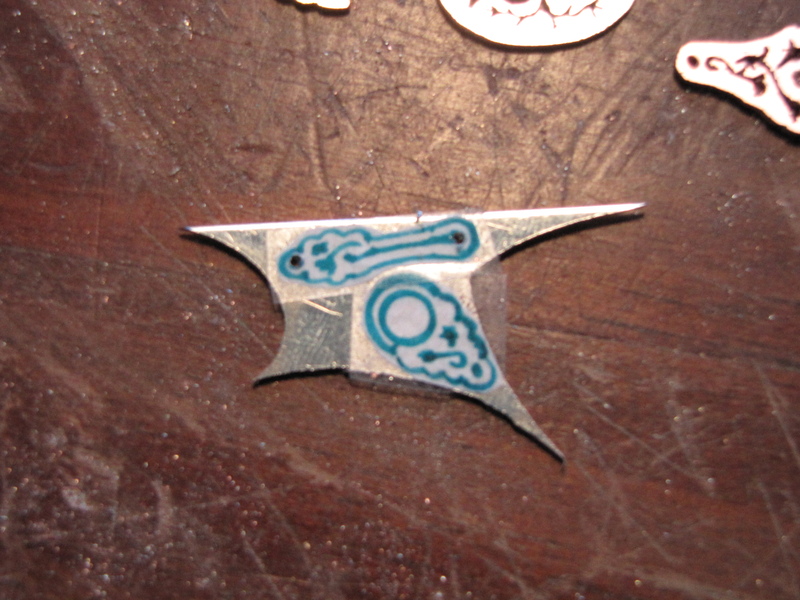 So I came up with a new clasp design. 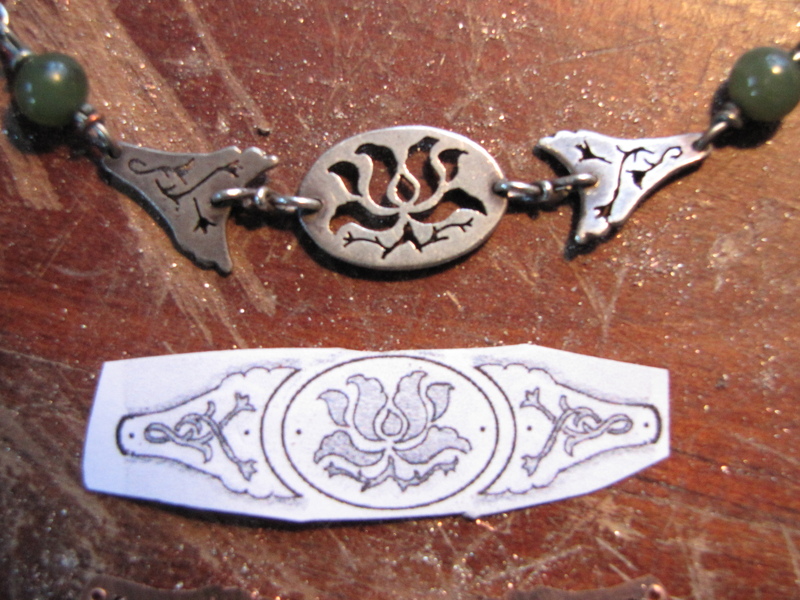 The clasp design for lotus necklace, taped on sterling silver and ready to drill and cut. I drilled it with a #60 drill bit. And then I proceeded to cut out the tiny pieces. Once everything was cut out it was time to file and sand each piece into an inch of its life. 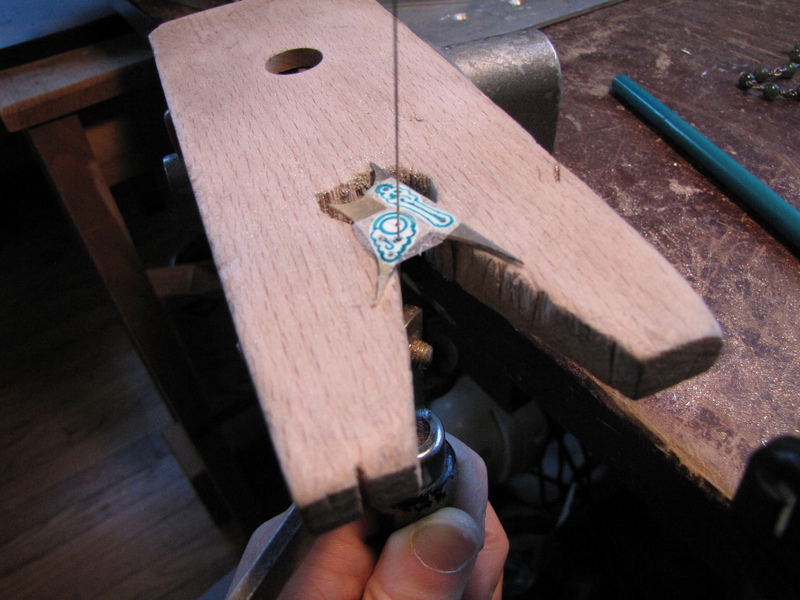 Then I annealed the hook part of the clasp, wrapped my pliers in painters’ tape to protect the soft sterling from the steel tools and formed the hook. After a little more sanding and then sealing everything in Renaissance Wax to protect them from scratches, all that was left was to make the chain of pearls. 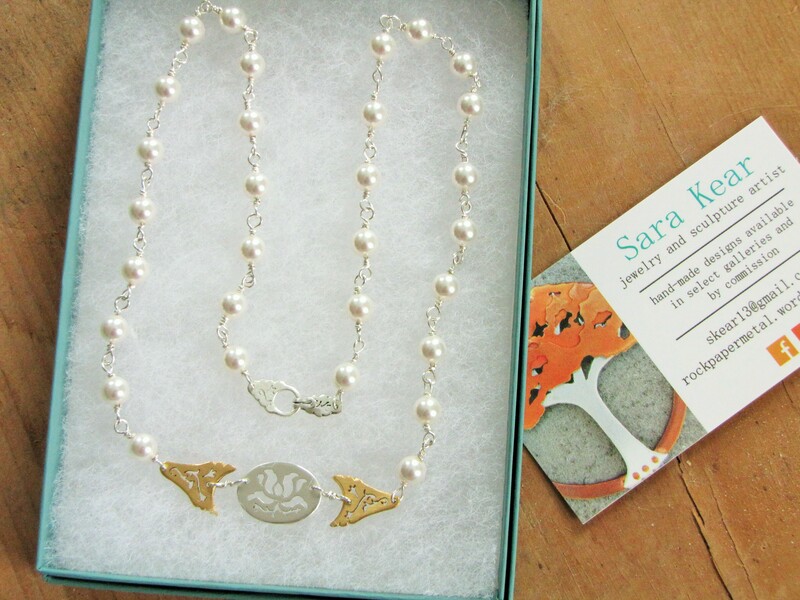 I think my favorite part (other than the exhilaration of cutting gold) was putting everything together with the afternoon sun streaming through my window and making the pearls, gold and silver practically glow in my hands. When it was done, all that was left was to package it up and call the fantastic couple who gave me this opportunity! It was a great experience for my break between semesters. And I hope I get to work with gold again soon. But for now, it is back to the land of intricate metal tea sets! I hope everyone had a wonderful holiday! Next time I’ll fill you in on this semester’s big project! It’s beautiful and I enjoyed reading about the process, your joy!